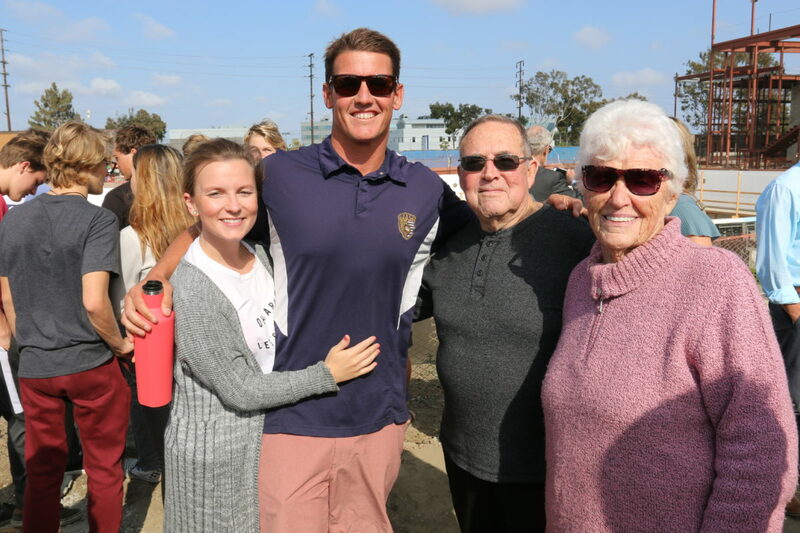 During the 1940s, 1950s, and 1960s, legendary El Segundo High School swim and water polo coach Urho Saari produced dozens of Olympic and nationally ranked swimmers at The El Segundo Plunge. In 1951, Saari’s water polo team, composed largely of his El Segundo High swimmers, won the bronze medal at the Pan American Games. The following year Saari coached the young team to a fourth-place finish at the Helsinki Olympics. His son Roy won a gold medal at the 1964 Tokyo Olympics, as a member of the 800-meter relay team. But since Saari’s retirement in 1973, the South Bay has produced few world-class swimmers. The last South Bay swimmer to go to the Olympics was Lelei Fonoimoana. The Mira Costa graduate placed seventh in the 100-meter butterfly at the 1976 Olympics in Montreal. The long-deferred dream of resurrecting El Segundo’s storied swim history will be realized on Saturday, September 29 when the City of El Segundo and the Wiseburn School district host a ribbon cutting for the new El Segundo Aquatic Center. The $13 million center’s 10-lane, 53 meters, Olympic-sized pool will be flanked by 500 stadium seats. The center will also have a four-lane, 25-yard short course pool, a jumbotron and stadium quality timing, lighting and sound systems and a 4,800 sq. ft gym. Its supporters are hopeful that the center will be an Olympic training venue when the Olympics come to Los Angeles in 2028. 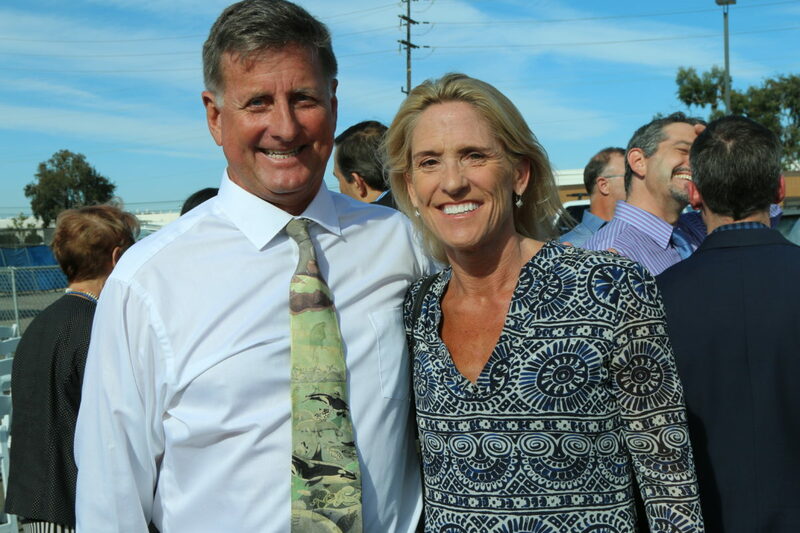 “We are laying the first building blocks for the home of the next Olympic champions,” Richard Lundquist said at the center’s April 2017 groundbreaking. 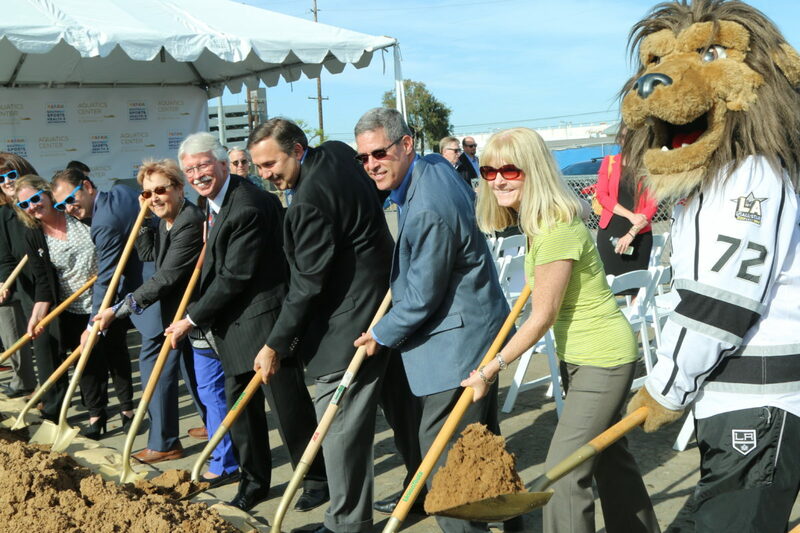 The Continental Development CEO heads the non-profit South Bay Sports, Health and Recreation, which has raised approximately $4 million for the project. The Wiseburn School District has contributed $6 million and the City of El Segundo $1.8 million. Some of the funds will be used to refurbish the Urho Saari Swim Stadium, otherwise known as The Plunge, in downtown El Segundo. The Plunge was built in 1940 by the Work Project Administration (WPA). The new aquatic center is east of Pacific Coast Highway, on Douglas Street, on property formerly occupied by Northrop Grumman. It is adjacent to the new Wiseburn/DaVinci High School. Wiseburn and El Segundo swim and water polo teams will share the aquatic center with community swim programs. Unlike other South Bay high school pools, the Aquatics Center pool will have an entrance separate from the Wiseburn campus, making it accessible to the public throughout the day. Lee Davis, chairperson of the El Segundo Parks and Rec Commission, and a Los Angeles County Lifeguard Baywatch captain, said he expects the aquatic center to be a feeder system for Los Angeles County Beach Lifeguards. “Lifeguarding and an aquatic center near the beach go hand in hand. Once kids become strong swimmers, they can enjoy the ocean and that leads them to want to become lifeguards,” Davis said. Davis received the Lifeguard Medal of Valor in 2014 for helping rescue two boaters whose boat broke up in heavy seas after crashing into the Marina del Rey break wall. Olympic medalist Cynthia “Sippy,” Woodhead said at the Aquatic Center groundbreaking that it will provide needed pool time for local swim clubs. Woodhead is a coach for the 250-member Beach Cities Swim Club. Because of the shortage of pools in the South Bay, her club must schedule workouts as far north as Santa Monica. In 1979, at age 15, Woodhead won five Gold Medals at the Pan American Games and was named World Swimmer of the Year. She also set three world records. The following year, she qualified for six events in the 1980 Moscow Olympics, prior to the U.S. announcing its boycott. She won a silver medal in the 200-meter freestyle at the 1984 Olympics in Los Angeles. Efforts to build an Olympic-caliber pool in the South Bay date back to the early 1980s when King Harbor Marina lessee Les Guthrie proposed, unsuccessfully, to build an Olympic swim stadium in his marina for the 1984 Olympics. In 2010, Redondo Union High School celebrated the opening of its new $6 million pool with a race between three of its varsity swimmers and 2008 Olympic gold medalist Jason Lezak. The Olympian praised the school district for building a pool that would inspire swimmers. “I never would have made it to that point in my career if I didn’t have the right place to train,” he said. But by design, the Redondo High pool was not built to Olympic specifications. The pool is 25 yards by 40 meters. 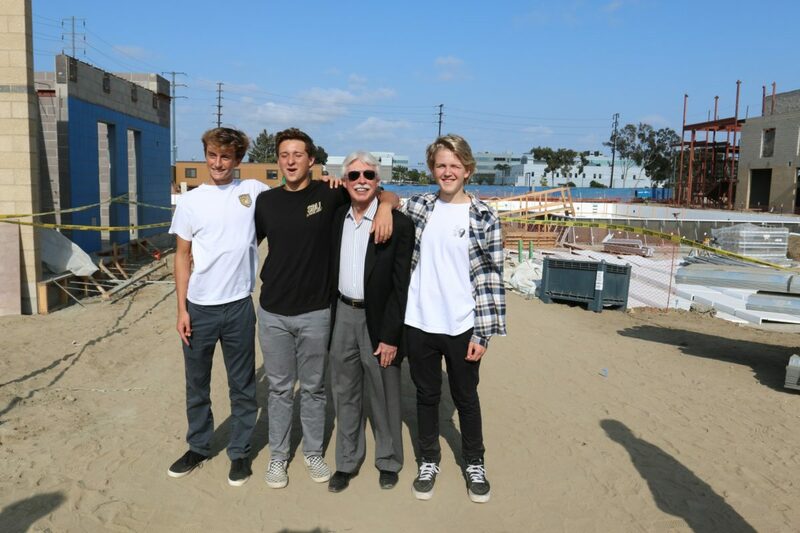 “We designed the pool for high school meets, which race 25-yard laps and to allow for both the swim teams and water polo teams to practice at the same time,” explained former Redondo School Board member and current Redondo Beach councilman Todd Loewenstein. The Torrance Plunge is Olympic-length but lacks a warm-up pool and other facilities required to host major swim meets. In 2015, the Manhattan Beach School Board discarded plans for an Olympic size pool to replace its ‘40s era, 25-yard Begg pool in Polliwog Park. Neighbors protested because they feared an Olympic pool “would become a regional venue for aquatic competitions, bringing increased traffic and parking problems,” according to a July 16, 2015, Easy Reader article. The El Segundo Aquatic Center, by contrast, has received broad community support. “Our goal is to integrate a well-rounded, robust, and comprehensive set of aquatic programs throughout all of our unique aquatic facilities, create participation growth and increase community access and benefits,” said Meredith Petit, El Segundo’s Director of Recreation and Parks. To help fund the Aquatics Center, former L.A. County Supervisor Don Knabe secured a $250,000 contribution from the County. The Chevron El Segundo Refinery has contributed $100,000. Continental Development Corporation has contributed $2 million. In April, a three week “Fill the Pool” community fundraiser raised over $250,000 in small donations. Other contributors include Kinecta Federal Credit Union, Skechers, Mar Ventures, Toyota, Mike and Barbara Briney, the LA Lakers and the LA Kings. To donate, or for more information visit ESAquatics.org. 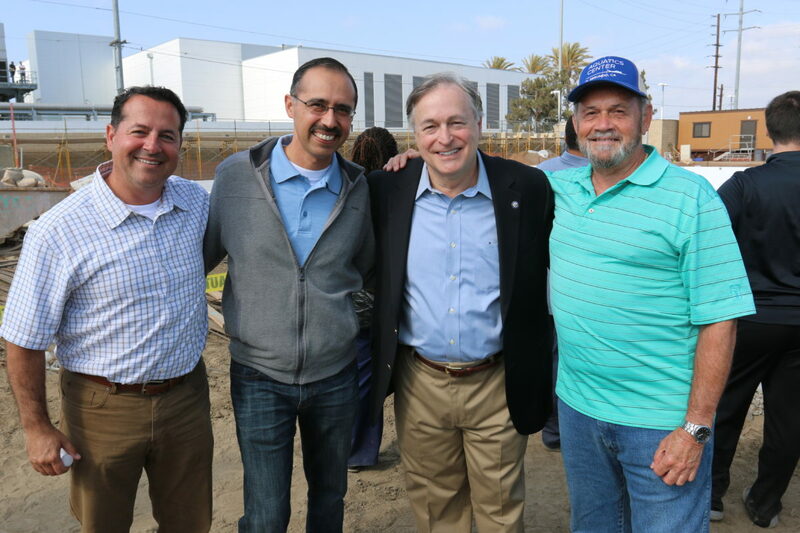 Wiseburn School Board members Nelson Martinez and Roger Banuelos with former El Segundo councilmembers Bill Fisher and Dave Atkinson. 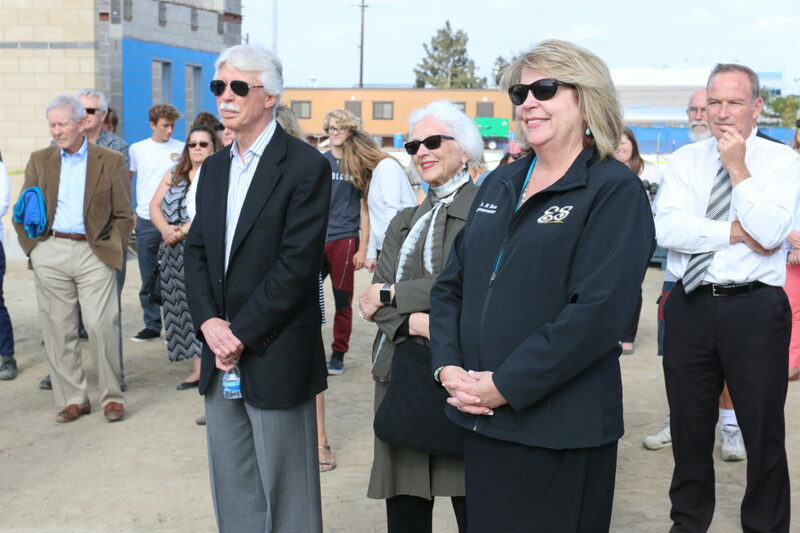 Richard Lundquist, El Segundo School Board member Nancy Cobb and El Segundo schools Superintendent Melissa Moore. Wiseburn School Board Member Neil Goldman, Sherry Kramer, Wiseburn School Board Member Nelson Martinez, El Segundo Parks and Rec chair Lee Davis, Wiseburn School Board member Roger Banuelos, former Wiseburn Superintendent Tom Johnston, El Segundo School Board President Emily Layne, El Segundo Councilwoman Carol Pirsztuk, El Segundo School Board member Bill Watkins and El Segundo City Councilman Scot Nicol. Julia and Riley Brady and Henry and Joan Stuart. Riley is the current El Segundo High Swim Coach. Stuart coached the swim team for 25 years. 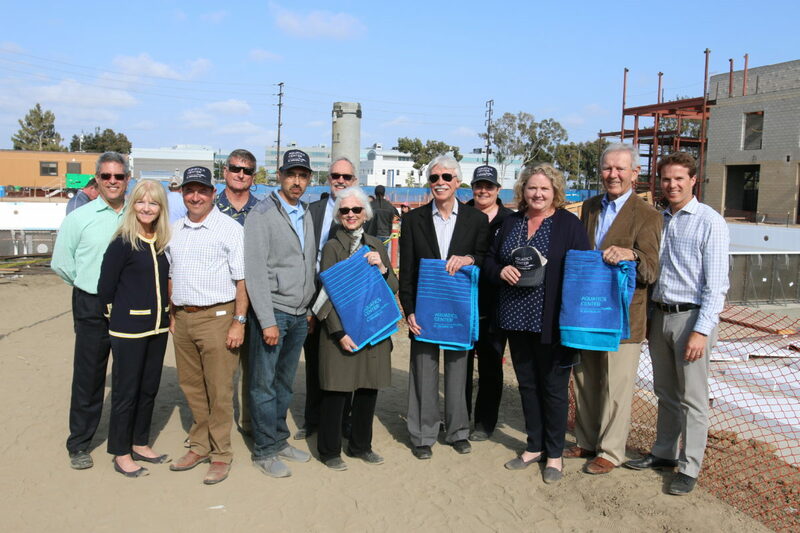 El Segundo Aquatic Center groundbreaking, April 2017.